If the musical health of a city is gauged by the number of concerts it hosts, then Singapore is in robust musical health. Most days of the week something is happening on the classical music front, and at weekends the diary can get very crowded indeed. This last weekend was a typical example, where very difficult choices had to be made about what to attend and what to miss. There was a big Mahler event taking place on Saturday, and I imagine most Singapore music-lovers gravitated towards that. Not me. I chose to give Mahler a miss and took the bus up to a remote hill-top monastery in Bukit Batok to hear some Byrd. The alliteration certainly attracted my attention. After all, as regular readers know, for me, alliteration absolutely always attracts attention – the concept of taking the Bukit Batok Byrd Bus was linguistically irresistible. But what really swung my choice in favour of Byrd was that Mahler symphonies are performed with such frequency in Singapore that I have reached saturation point – I think I could go to my grave quite happily now without ever hearing another Mahler symphony. I’ve heard Mahler 2 more times over the last decade in Singapore than I did in my entire previous existence, and much as I like the work, a little over-indulgent emotional excess can go a very long way indeed. I count the music of William Byrd among my most absolute favourite. I checked my personal record collection just now, and discovered I had more recordings of Byrd than of any other single composer. I was probably around five or six when I first encountered Byrd. Since then I have sung Byrd, accompanied Byrd and conducted Byrd. When I was in England I reckon I heard Byrd at least once a week. But in Singapore Byrd is rare, and when you do catch some, it is always a moment to savour. I hear it from time to time sung liturgically in the Cathedral of the Good Shepherd, but despite a plethora of choirs in Singapore, few are either willing or able to tackle Byrd. After all to sing Byrd properly requires a particular level of intellectual insight and musical wit, and I’m not sure the current pool of American-trained, soft-core-pop-orientated choral directors possesses that sort of insight or wit. 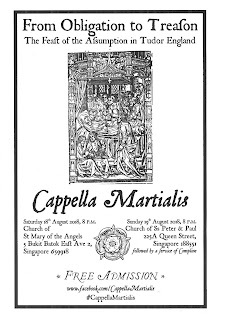 Cappella Martialis is a small group of like-minded enthusiasts who specialise in singing the kind of sacred and liturgical music which forms the very foundations of modern choral singing. They may not do it particularly well technically, but they do it with love and sincerity, and that, to me, matters far, far more than having every little detail perfectly manicured. On Saturday more than once things seemed on the brink of collapse as a voice or two fell by the wayside, as tuning sagged, balance wobbled dangerously and stability of pitch was a very rare commodity. (Why do choirs here seem so terrified of pitch pipes? Surely it’s better for the singers to hear their pitch blown clearly and steadily, than to wait for a single member to pluck a starting note from a tuning fork thrust against an ear-lobe?) But there was a powerful feeling of collective involvement in the spirit of the music which easily overwhelmed these technical flaws. 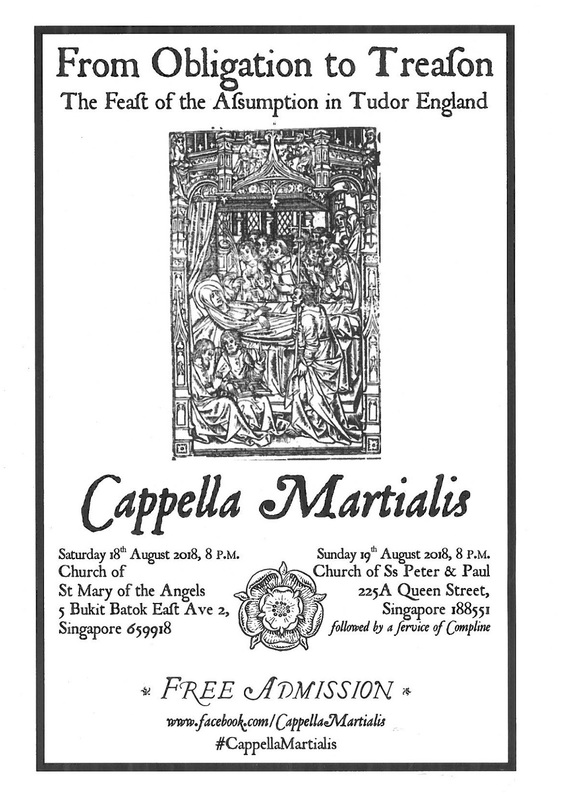 When I had last seen Cappella Martialis perform, they had rather spoiled things with a stage manner which reminded me of nothing other than a flock of sheep in a field determined to avoid the ministrations of the guiding sheep dog. Things had improved beyond measure for this performance, and as a stage presentation, it had a good sense of occasion and a feeling that it had been, at the very least, thought through. There did seem to have been a little pay off in quality of singing, and the conductor’s single-minded obsession with beating time and keeping the singers together meant that everything sounded as if it was being sung by a group of individuals jogging around the athletics track – a notion reinforced by the very obvious beating time from singers with both hands firmly affixed to copies. But if on a purely technical level the singing lacked polish, and there was a lurking suspicion that it simply had not been rehearsed thoroughly enough, there was absolute sincerity and conviction in this singing which transcended everything else in the performance. It had the power to move and inspire; it was not a pretty sound but it was dazzling in the beauty of vision it conjured up in the listener. Perhaps the most impressive thing here, though, was the obvious amount of deep and thorough research which had gone into the programme. Cappella Martialis programme booklets are a work of art, full of fascinating historical insight, beautiful and carefully chosen illustrations, and so much information, that they are best read at leisure (which is why, I assume, they send out the programme booklets in advance to the audience). They are also privileged to have among their number a fine scholar who delivers fascinating, enlightening and intriguing insights to set the music in context before each part of the concert. Among the gems he offered up on Saturday night was the thought that we were hearing music which was not just written as an act of rebellion, but as one of treason. 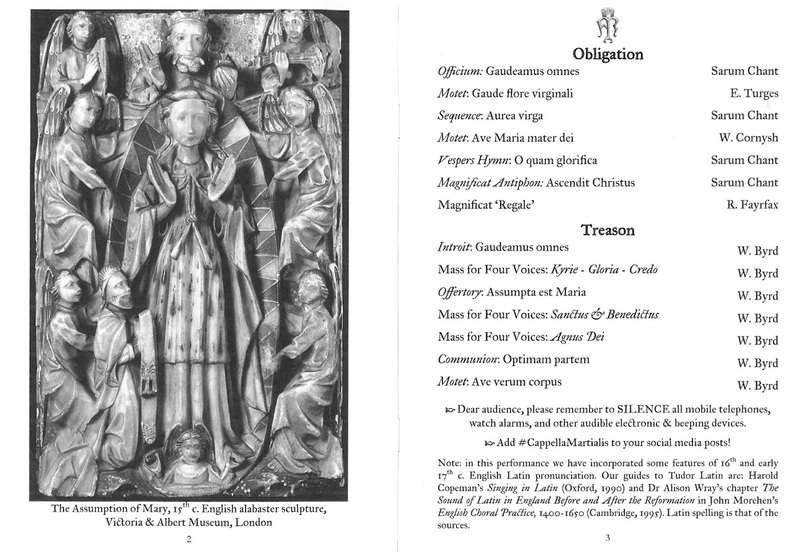 He drew our attention to little coded messages and signs in the music; and I have to confess to having become so familiar with these works that I had never stopped to think much about either their context or these coded signs. When the choir sang the word “Catholic” in the Credo from the Mass for Four Voices, suddenly moving into chordal harmony and repeating the word, the incredible bravery and political risk Byrd was taking was revealed in all its amazing glory. Here was a concert which conclusively showed that, if the music is good enough, we do not need a polished, technically flawless performance to convey its meaning. All we need are people who both understand and love what it is all about, and we certainly had those on this occasion. My decision to give Mahler the Byrd on Saturday was thoroughly vindicated. Here is a forty-seventh disc to add to that list and it is unquestionably one of the best. 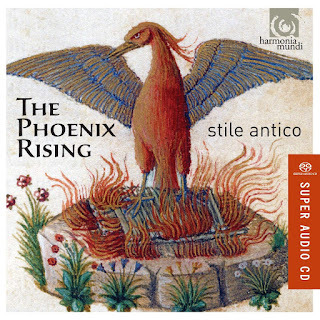 Stile Antico, a relatively new player on the block, formed in 2001 , has already established itself as a leading group in the Early Music vocal arena, and this is only the latest in a long line of extremely impressive discs released on the Harmonia Mundi label. Its collective (conductorless) approach pays particular dividends in this repertoire where the music depends on an instinctive reaction from the individual singers rather than a sense of order created by a firm hand on the tiller. Nowhere is this more obvious than in Gibbons’s O clap your hands, where the sprightly rhythms here have an appropriately percussive edge while the occasional false relations have a spine-tingling spiciness brought about by clashes which feel as if they happen by accident rather than design. Clarity of texture, driving tempos and superb diction are all there, but what is more vivid is the glorious freshness and vitality of this singing. Did Choirs Exist Before the Internet? The BBC is to blame for my arriving at work this morning a little late. Just as I was about to leave home, on came a news item about a choir in Brisbane which meets in a pub. I was interested in the story, of course, and particularly by the fact that the BBC devoted so much air time to it today, bearing in mind issues such as the violent aftermath of the Zimbabwe elections, ructions in the British Labour Party, the running out of funds by an English council, a Mexican airliner crash and the clearing up after an Indonesian earthquake, all hot news topics which could easily have occupied a whole half-hour’s news slot. Interested as I was, and fascinated by the visuals accompanying the report (which seemed to be largely drawn from a private publicity video), I found myself wondering why it was appearing on the world news today. Why was it newsworthy? Choirs have been meeting in pubs for centuries. Virtually every English cathedral has a pub next door to which the choirmen retreat before and after - and sometimes during - practices and performances. I ran a Welsh male voice choir which, after each weekly short rehearsal in a dreary school hall, repaired to the pub where practice continued until closing time. (The first commercial recording in which I was involved as an organist was of another Welsh male choir which, after several fruitless studio sessions, was told to go to the pub next door and practice there, only coming back when they were in full voice – which worked a treat!) I used to sing in a community choir which met in the local pub, and I’ve never sung with any group of carol singers which hasn’t followed the centuries’ old tradition of ending their sessions in a pub or two. Everyone in the business knows that singing, that most intimate and personal of musical activities, is best carried out in a comfortable environment and with inner restraints relaxed by alcohol and atmosphere. What more obvious place to rehearse (and perform) than in a local pub? My question was answered only near the end of the BBC report when the person doing the voice-over pointed out that the pub choir in Australia had become “a social media sensation”. Ah! Social Media! The only reality many of today’s citizens of the world recognise! It has long troubled me that the internet and, in particular, social media is seen as the sole legitimiser of existence. Unless we photograph our food, our pets, our children and ourselves in every conceivable situation and at every moment of our existence, and then share that to an impersonal mass of “friends” via social media, our very existence has no legitimacy. When I scroll down my Facebook page – which I do with rather disturbing frequency – I promise myself that I will do something more productive the moment I encounter the first photo of a cute cat, dopey dog, boisterous baby or foul food. I never do simply because that is usually about the second (if not the first) item I find. People I have never met, never heard of or who have never shown the slightest interest in me, regale me with endless pictures of their hideous kids, their ghastly pets, their obnoxious dietary fads, and of course selfies, often adorned with cartoon-like frames reinforcing my notion that they do not exist in real life at all. But I chose to sign up to Facebook (after all, why should I be alone in denying the Russians, the Americans, and every Middle-East terrorist organisation access to my bank account, my passwords and every last detail of my personal life, friends, family, address and occupation?). Part of the reason I do so is a prurient fascination in the mundane lives and dreary interests of mediocre people who I would never rub shoulders with in real life. In short, social media, for me, represents an entertainment and a diversion from my own reality. What troubles me is that so many see it not as a diversion, but as reality itself. Too many foolishly use it as the forum for expressing deeply held views of some personal import. Because of the nature of social media, these deeply held views are invariably ridiculed and diminished by others who feel empowered to comment because they have been given equal access to ideas and notions even though they lie way beyond their comprehension. Thus it is that, despite the fact that choirs have been meeting, rehearsing and practising in pubs for centuries, it only becomes reality when it is posted on social media and attracts “followers” (ie. bored people with nothing better to do with their lives). Working as an editor for a Hong Kong musical organisation, I encounter many young and enthusiastic people who, keen to learn, nevertheless find the boundaries of their learning defined by what is available on the internet. Frequently, when I write something original about a composer or a piece of music, I am asked; “How do you know that? I don’t see it on the internet”; the inference being that if it’s not on the internet, it doesn’t exist. A former Malaysian student doing some research on nerves in music performance asked me for some guidance as to suitable materials. I pointed him in the direction of an excellent book written by one of my former tutors at Cardiff sometime in the 1970s. I gave him the details, but was told I had to be wrong as the book didn’t exist. “It does”, I told him, and “I have a copy on my shelf at home”. “You can’t”, he retorted, “There’s no mention of it on Amazon or any of the other sites I checked”. Preparing reading lists for my own students, I continually find uniquely valuable published resources which are not available on the internet other than in plagiarised extracts included on free-to-access sites. If I refer to a site for which payment is required, students routinely refuse to access it, arguing that they can find all they need (as if they know) on Wikipedia and other freely available sites. At a meeting the other day, one academic suggested that he saw a time when libraries would no longer exist as physical resources; “Young people can find with a few key strokes more material online and more quickly than we ever have been able to through books and CDs”. I chose not to suggest that the material they thus found might not be of equal value and quality, instinctively knowing that I would be accused of being a dinosaur, of living in the past, of holding on to obsolete and old-fashioned notions in the face of unstoppable technological advances. Yes, I am a dinosaur. I do prefer physical books and physical CDs (even LPs and 78s! ), and I continue to subscribe to a number of print journals which mostly end up in the recycle bin. But I also spend most of my waking hours online, researching, reading and learning. We live in an age when we have wonderful opportunities presented to us by the sheer amount of information available to us from a plethora of sources, and by our ease of access to it. But we cannot process so much as individuals and need to develop skills of selectivity; not simply dismiss old technologies and unthinkingly accept social media and online resources as the sole repositories of legitimacy. Like the BBC report, if we do that, we lose that vast wealth of accumulated knowledge which remains in the memories of so many, yet has never quite found its way on to an online resource. We run the risk of allowing future generations to believe that nothing in music existed before the internet.